Magic Rock Brewing Co. is a fairly new brewery based in Huddersfield. Their aim is to brew big, modern beers and they do that very well indeed. 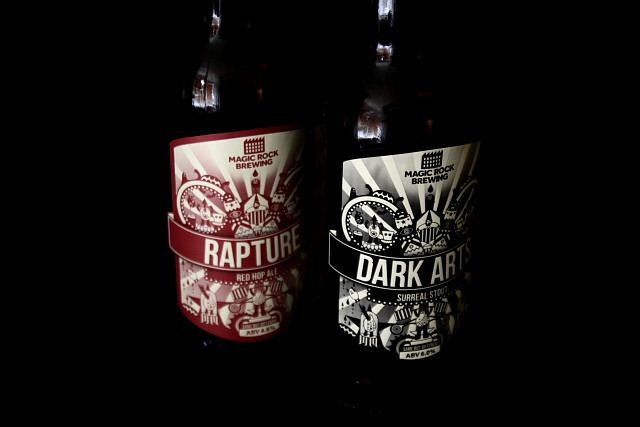 First up is Rapture, a huge red beer with the capacity to scare the living daylights out of mere mortals. It’s a monster of a beer that grabs and shakes you around, toying with you in the same way that a cat would with a dazed mouse. There’s a beguiling sweetness to it, a citrus flavour that veers towards rich and dessert-like. Think eating a slice of incredible cake in the middle of a forest after a downpour, sweet pine in the nose. There are five types of malt and six different hops crammed into this bottle, which explains the complexity and the sheer excitement of it all. The bottle claims to be the ‘same, but different’ which is clearly a lie. There’s nothing else like this. It’s a different beast entirely. More of a ruthless assassin against Rapture’s seductive killer. 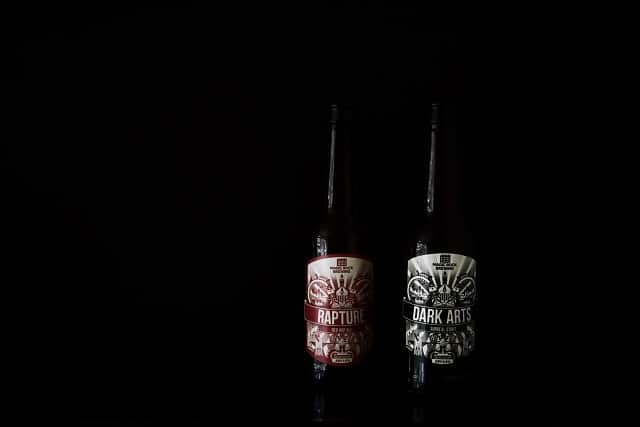 Smooth and velvet, with all the taste of toasted nuts and licorice you’d expect from a stout, Dark Arts has a long and complex taste that leaves the drinker feeling as if they’ve been punched in the face, the bittersweet aftertaste lingering long after the drink itself has left. If this beer were to be personified, it’d be dressed in black, silently melting into the night, unscrewing the silencer from its gun muzzle, a trail of expertly executed mayhem left exploding in its wake. The Devil in a glass. Both of these, and a couple more from Magic Rock Brewing are available at the excellent Saltaire Wines. Haha – funny post! You obviously enjoy your beer. I enjoy Miller Lite on occasion. Good write up Rich (nice photos too!). I finally got myself down to Saltaire Wines and just in time as stocks seemed to be dwindling, although I’ve drunk my fair share of Rapture and I concur! Bought a bottle of Dark Arts which I look forward to trying. Did you get a bottle of the Human Cannonball? would like to see your review of that performance! I haven’t got Human Cannonball yet….I suspect that Saltaire Wines have probably sold out by now. Funny you should say that, I’ve just blogged about my second (and no less fun) encounter with Human Cannonball. Wonderful beers all round ,really – the whole package. My brewery of 2011? Possibly. Very likely. Ps. Awesome photo.